UK weather – How does this affect your log cabin? The UK weather can be wet and this can be detrimental to the long term health of your logs (and other timber elements), if it is not dealt with in the correct way! The geographic location if the UK and the prevailing winds, mean as an island, rainfall is usually plentiful. After all there is a reason the UK was described be a famous poet as a “green and pleasant land!” In a damper climate you must ensure your timber, but especially your logs are very well protected and maintained. Now certain design elements will help to deal with precipitation, but particularly the logs must be maintained regularly, to ensure the timber does not deteriorate. In these type of weather conditions, you must stop any moisture penetrating into your logs. What can we do to help combat the damper UK weather? This will be covered in more depth in our design section, but we will try to highlight the main points here. There are certain design features which help to keep the weather, (with the UK weather the rain), away from your logs, as much as possible. In particular try and protect really well any areas where moisture can potentially penetrate. So these areas are, openings for windows and doors, corner joints and and the bottom logs. Now these can be impacted by your roof design, any window and door trim externally and the quality of the log joints, especially in the corners (where log ends are the most exposed). A large roof overhang can give a lot of protection from the elements and whilst there is some additional cost, you will also find the overall appearance of your log cabin will be enhanced. Similarly good window and door trim, can not only serve to keep moisture out, but look great too! 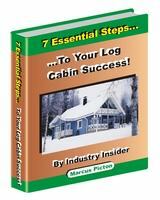 Take a look at our log cabin design for more info. One good thing to consider when planning your log cabin for the UK weather, is it’s exact location and orientation. Whilst you will primarily want to decide this for the ultimate living experience i.e. maximizing solar gain and also views, think about the prevailing wind direction and where the rain will tend to drive from. If there is a lot of windows and doors on this side of the building, then could the design be altered to minimize any potential problem occurring. I am not saying to compromise your design for the sake of the weather, but be aware a gable elevation has more area and is therefore usually more exposed to the elements. If you have large glazed areas towards the prevailing wind direction, ensure the methods used to seal around windows and doors are up to scratch. Find out more on this in our window and door section. With the UK weather you MUST pay attention to maintenance of your logs. All your external timber will need maintenance but your logs are an integral part of the structure and must be looked after at all costs. Remember your log all interlock and overlap each other on every course, replacement and repair can be an extremely tricky and expensive option. It is best to avoid this situation ever having to arise and this can be done with a few simple checks. The unfortunate thing is things we see every day can change so gradually we maybe fail to notice the differences. For this reason periodic checks should be done, so that any preventative action can be done at once. Keeping the paint in good condition is very important and don’t be tempted to neglect this. The end grain on your logs, is the most susceptible area and these should be monitored the closest. Remember the sunlight (or really ultra violet light) will affect your paint or wood stain considerably, so southern facing elements also can often need more attention than a north facing one. Whilst many people will just paint their log cabin at certain intervals, sometimes some walls need painting a lot sooner, whilst others can last longer. For more detail, please visit our maintenance section.